Imagine a condition where you have to send an urgent email to your boss and you encounter an error message MS Outlook Sending and Receiving. In the daily usage of Outlook, we usually have confronted such error statements. In this condition, we desire to find out the approaches for fast and 100% error solution of Outlook. One can check out this article in-depth to troubleshoot the problem as soon as possible. General Tip: If you find that the message is caused due to corruption in Outlook then, generate an error-free PST file with help of Outlook Recovery Tool. In order to fix Outlook sending or receiving error, one can opt for any of the provided methods. Well, once users are completed with one technique, test Outlook by sending an email. This will be helping in ensuring whether your sending receiving error is fixed or not. If in case it continues then, prompt to next solution. The email scanning feature is enabled by anti-virus programs of the PC. If the primary system is having anti-virus app installed on the machine then, users have to perform some additional tasks. This set of activities involves Outlook configuration with anti-virus app for fixing MS Outlook sending and receiving error. The Outlook email application is providing an inbuilt feature of spamming. Still, there is a chance where users can encounter suspected emails in their account. Therefore, it is recommended to launch web mailing account and eliminate all the suspected emails. This action will remove the corrupted from program and help in bringing back Outlook in its functional stage. Examine the firewall program configuration, which permits Outlook.exe file to work on the Internet. An essential fact is to be kept in consideration that this workaround may cause any kind of malware attack on the PC. Therefore, it is recommended that execute this approach at your own risk. 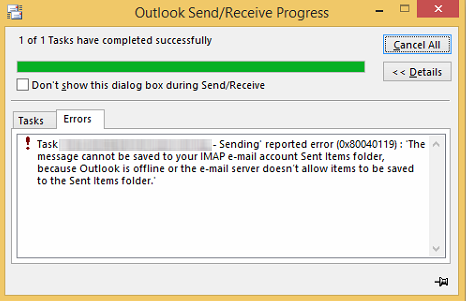 MS Outlook sending and receiving error can be fixed by working in Outlook safe mode. This can be done by pressing Ctrl key and then, clicking on the desktop icon of Outlook. At last, the program opens with eliminated unnecessary add-ons. A condition appears where a heavy mail is sent from MS Outlook. This leads to a stuck situation where a message is held in outbox. Whenever users try to delete that message, he/she encounters an interruption statement. Therefore, to fix this issue, modify the mode of Outlook in an offline manner. After this, remove all emails from Outlook folder and then, move back Outlook to online mode. There are chances that information entered for the SMTP server might be invalid. If the server credentials are wrong then, hundred and ten percent you are going to encounter MS Outlook sending and receiving error message. To troubleshoot this error, contact the server provider and ask him for valid credentials. For an Outlook expert, it is not difficult to fix this MS Outlook sending and receiving error. But, if talking about a general computer user then, it is going to be a difficult task. In such cases, you are advised to contact to your technical expert for fixing the problem. It is so because the problem generally occurs due to internet unavailability or improper Outlook configuration. We hope that the page proves itself in fixing your problem.